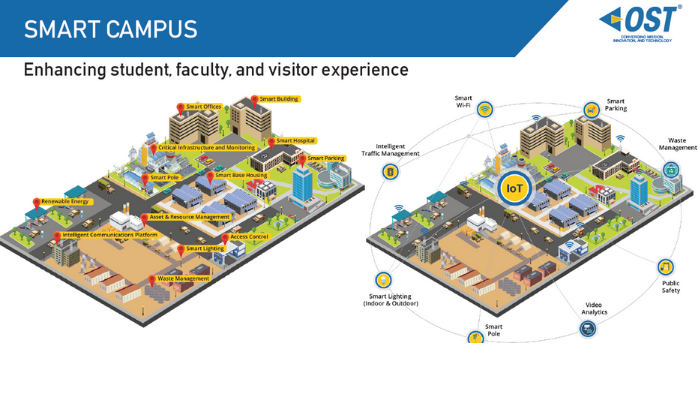 A Smart Campus is a cohesive campus with cutting-edge security, resource management, and access control. OST enhances the campus experience for students, faculty, and visitors. As a Smart Infrastructure systems integrator, OST helps authorities to deliver higher-quality services more efficiently while realizing major cost savings and revenue generation. We also provide Public-Private Partnership (P3) financing solutions that will cover 100 percent of up-front costs for each project. Additional sensors on Smart Poles to measure and monitor CO2 emissions, greenhouse gas emissions, gas leakage, temperature, humidity, waste levels, etc. State of the art Emergency Operations Center (EOC), Security Operations Center (SOC), etc. Implement better surveillance with CCTV cameras, sensors, detectors, etc.